Linux distributions already make it easy to try them out without comitting yourself beyond your comfort zone. Most will guide you through partitioning your disk so that you don’t lose what is already installed, and may provide live media which allow you to boot from a CD, DVD or USB stick and try out the distro without any risk whatsoever. 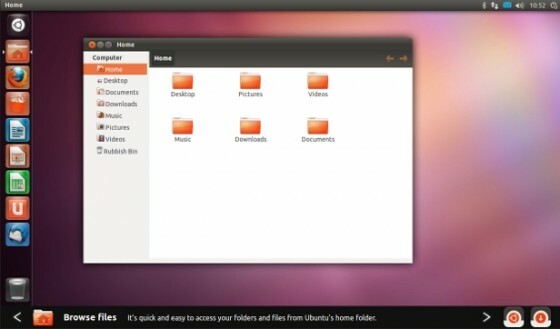 Canonical, the folks behind Ubuntu, have now made it even easier to try out their distro with a virtual desktop online (which I found via +rich scadding). While Unity is not for me (Gnome Shell FTW) I do think that this is a great idea, and one that has been very well implemented. I’ve seen this Great Linux World Map, from Dedoimedo before, but seeing it again on Tentacled Monkey in Exile reminded me that I hadn’t mentioned it yet. And it’s certainlty worth a mention. I particularly like the fact that I appear to be sailing northwards, having started out in The Great Communist Empire of Ubuntu I am now floating in the Sabayon Sea and wondering if – or when – I should attempt a landing in the Forbidden Land of Gentoo. Six months ago, I mentioned the creakiness of my desktop PC and rambled a bit about the various steps I’d taken to keep the memory usage under control. I have done a little more tinkering recently, so now is as good a time as any to ramble some more. First of all, a disclaimer. I do understand that the best approach would be to either start from a minimal install and build up only what I want, or to find a lighter distro in the first place. The reason I haven’t done this is because my desktop hardware is not as reliable as it could be. This is especially true of the CD/DVD drive. Consequently, I don’t want to install anything from scratch because, if the drive does fail halfway through an install, recovering it will be a nightmare. And I have no intention of replacing any of the hardware on this machine – it is an old box and no longer my primary device so I simply want to ensure that it remains responsive until such time as the hardware fails completely. I have been a Gnome user since I started using Linux on the desktop and, for me, the huge strength of Gnome has always been that it is an incredibly intuitive desktop to use. However, all this functionality comes at a price in terms of the system resources used, so I started looking at lighter desktop environments. My first thought was to give Enlightenment a go. There was a very long blog post about this that has now been deleted but the shorter version is that once you start finding your way around, it’s a very nice environment and one that appeals to the minimalist in me. However, it’s not the most intuitive desktop environment I’ve seen and, bearing in mind that the PC has a guest account for when people come to visit, Enlightenment is not the way to go. So I had a look at Xfce. It’s lovely. The default theme is every bit as intuitive as Gnome and this is the theme (largely untouched) that the guest account still uses. Things started to become interesting, however, when I started playing around with the Xfce Settings Manager. Not only are the panels very configurable, but Xfce also allows you to do a lot with the right and middle mouse buttons, so I started seeing how much desktop real estate I could free up. This is the state of my desktop so far. The Xfce button and notification area are in the top left. In the bottom left – although the auto-hide means you can’t see it – is the task list and wastebasket. In the bottom right is the workspace switcher, which I am thinking about removing since I can access the same functionality by using the middle mouse button. I am also considering having a single, auto hiding, panel in the bottom left of the screen to maximise my available desktop space. And then there is the cornucopia of options at Xfce-Look.org. Of course, none of this matters (much) if it doesn’t achieve the primary aim of squeezing a bit of extra performance out of the desktop PC. Fortunately it does, spectacularly. The PC is noticeably more responsive and, according to the System Monitor, the Xfce components are sucking up a lot less memory than the Gnome equivalents. In other news, I have replaced Epiphany with Midori and uninstalled Mono. I have looked at Midori in the past, but Epiphany is the browser I keep coming back to. I have found it to be both fast and light and it has the best approach to managing bookmarks that I have encountered to date. Midori, like Epiphany, is a WebKit browser and it is also fast and responsive. It is also part of the Xfce Goodies component so I thought I’d give it another go. I won’t try to make any speed comparisons, but I have been impressed so far. As for Mono, I don’t use any of the few, small applications on my PC that depend on it and – quite frankly – having to start the Mono runtime just to launch Tomboy Notes feels like overkill to me. I am intending to try and find some smaller, lighter applications for the PC and Mono is the first to go. I installed Xfce last weekend but it hasn’t been until this weekend that I have really had a chance to play around with it. What I’ve seen of it so far is fast, flexible and a real joy to use. I first tried Ubuntu way back in 2007 and finally abandoned Windows when Hardy Heron came out on April 2008. At the time Ubuntu was a lot faster than Windows XP – and probably still is. However, I have found that as time has progressed it has started to creak a bit on my desktop. I tried a few other distros earlier this year but eventually came back to Ubuntu mainly because it does just work. A few weeks ago I had a bit of time and started looking around for lighter distros again. At this point I discovered that my CD/DVD drive had finally crapped out to the extent that burning an ISO was a gamble and trying to boot from it was hopeless. So now it’s time for Plan B – rip out all the stuff that I’m not using. First to go is Gwibber. I started using this shortly after I signed up to Twitter and it does have some nice features. However it has also become something of a memory hog and appears to be struggling somewhat with the authentication changes Twitter recently implemented. Right now I’m satisfying my microblogging cravings with Pino on Identi.ca and am not missing Twitter at all. Even though Gwibber isn’t running on my PC, gwibber-service is sucking up memory so it’s been completely uninstalled. Next to go is Ubuntu One. I know there is a fair bit of hype around this but, since it was introduced I can count the number of times I’ve used it on the thumb of one hand. The ubuntuone-synchdaemon is sucking up a sizeable chunk of my minimal memory, so it has to go. Next to go is DesktopCouch. The desktopcouch-service is costing me half as much memory as Ubuntu One was and, since I’m no longer using Gwibber, I don’t need it. The question of why a twitter client should need any sort of database is something I shall leave to more surreal minds than mine. Not deleted but no longer used is Firefox. For a while I have been using Epiphany as my main browser – it’s blisteringly fast very light, and has by far the best approach to bookmarks that I have seen. Rather than having to maintain a bunch of folders to manage your bookmarks what you do with Epiphany is simply tag each bookmark with as many or as few tags as you want and then let the browser figure out the folder structure for you. There are a few services that I don’t expect to use but might. These have not been uninstalled but have been removed from my Startup Applications. They are; the Bluetooth Manager (I have a Bluetooth dongle but it’s horribly unreliable); the Evolution Alarm Notifier (I don’t use alarms in Evolution); and the Power Manager (I have a desktop PC, not a laptop). Since Upgrading to Ubuntu Lucid, I’ve found that the memory usage on my PC regularly rises to 80% and everything starts grinding to a halt. I’m now using less than 50% of the available memory and am, once again, enjoying a slick and speedy desktop experience. Until recently, my microblogging client of choice has been Gwibber. When it was first released, Gwibber was fast, stable and – most importantly – allowed me to follow multiple streams from the same window. But time moves on and Gwibber has become increasingly bloated and, frankly, a lot less stable than it should be. I’m impressed so far. Pino is fast and light and the only problems I’ve encountered so far can be put down to the fact that Twitter is being unbelievably unresponsive – again. It would be nice, however, if I could follow both streams in the same window. I normally find that Evolution is a very stable and very functional piece of software. But if it does end abnormally (by a sudden, and unexpected system restart, for example), the database managing the various mailbox files and folders can become corrupted. It’s taken me all morning to find a solution – one that turned out to be annoyingly simple in its effectiveness. Restart Evolution again. It will rebuild the database and everything should synch successfully. Wait until the status bar at the bottom is empty. This could take several seconds. Find the process ID for ‘gconfd’: ps -ef|grep gconfd. Start Evolution client. You will be prompted to start creating your accounts. I know I said yesterday that I was going to stick with Sabayon for a while but, after it failed to boot this morning, I changed my mind. So now I have a Karmic Koala on my desktop. I did have a look around to see what else was out there at the moment but, because I am looking for a stable Gnome environment, Ubuntu was the distro I kept on coming back to. Not all was plain sailing, however, and my NVidia graphics card remained unrecognised until I found this page which describes how to manually install the the relevant driver. Accept the licence agreement and allow it to update xorg.conf when asked. This may be a bit out of date now that Sabayon 5.2 is out but, having borked my system to the point that I needed to re-install from my 5.1 DVD, here are the post-install steps in one handy location. Bring the package list for the package manager up to date. There are several steps to be done and some of them take a while, but it’s a one-time deal (unless, like me, you keep breaking things). The update notifier should now inform you that there are lots of updates to install. Start Sulfur and install them. It would probably be quicker if I did this from the command line, but I do like the fact that Sulfur tells me what I’m installing. This, as far as I can see, brings you right up to the current release so there is no need to make any changes to repositories.conf. Instead, you can go ahead and start installing all of the normally used applications. There is a minor ‘gotcha’ to bear in mind here – Spam Assasin isn’t installed by default so it needs to be manually installed before you start Evolution. On the whole, I do like Sabayon. When it works it’s a stable and reliable distro but, when compared to Ubuntu, if can be a bit too easy to break. I have (very briefly) looked at a few other distros but the only two I have so far installed are Ubuntu and Sabayon. Ubuntu does do a great job of shielding the end-user from the complexities of the OS and, as such, makes for a great first distro. Sabayon, on the other hand, does expect you to have some idea of what you are doing. And I want to gain a better idea of what I am doing, what is generic, what is good practice and a better understanding of how the various distros compare. I am planning to stick with Sabayon for now, not least because of its visual appeal, but it is also entirely possible that I will give another distro a spin at some point. Six months ago I decided to take another look at Linux and installed Ubuntu in a second partition on my PC. Not wanting to dual boot indefinitely I decided to see how things went for six months and then reinstall with either a fully windows or fully Ubuntu environment. Yesterday Canonical – the people behind Ubuntu – released version 8.04 of the operating system and, not having booted into Windows since early January, I had no qualms about wiping Windows from my hard drive. And, with a bit of preparation up front, it all went incredibly smoothly. The short version is: backup the home folder; format the drive and install; restore the home folder; reboot. I haven’t had a lot of time to play around with it as yet but the first thing I noticed was how fast it is. The system boots up in under a minute and applications are launching at a blistering speed. But for now, it’s back to Jamendo to download (again) all of the music I deleted in order to fit my data on a USB key.